Today LG Electronics announced that it will demonstrate a 55" rollable OLED TV at CES 2016 (which will take place in Las Vegas, on January 6-9). This is just a prototype, of course, but according to LG Display's original plan, it will have production ready 60" UHD rollable transparent OLEDs by 2017. 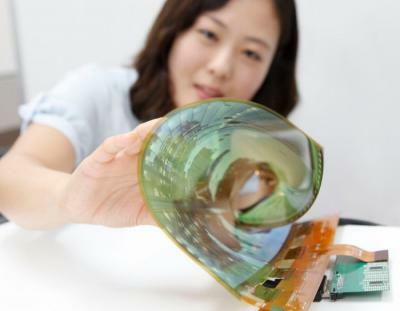 LG will soon launch a bendable TV, the 77" EG9900. The company also developed 0.97-mm flexible OLED "wallpaper" TVs that attach magnetically to a wall and can be "peeled off". Of course a plastic-based rollable TV is much more exciting than today's thin curved/bendable panels. And how many rollable displays can be stored in a container? And just think how many of this large TV-displays can be stored in a container? Large rollable superthin TV-displays, will of course make it possible to store many more of in a container for transport to all customers in the world. That's a good point, if they stay that way and can be held longterm.